How do the reference numbers work? What are Obverse and Reverse? Why are some farthings artificially darkened? What is a mintage, and why are mintage figures not included? What is a model farthing? Elizabeth’s bust facing right, wearing a wreath containing 6 berries and 11 leaves, which is tied behind the head with a ribbon, the ends of which trail loosely behind. The engravers initials M.G. are incuse, generally faint, and are located on the raised edge found at the base of the bust above the “BR” of BRITT. 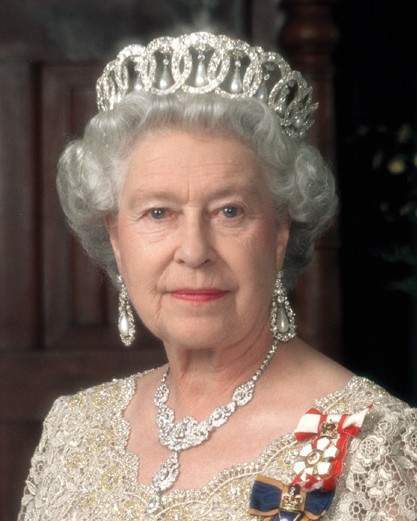 The legend which reads “ELIZABETH II DEI GRA: BRITT: OMN: REGINA F: D:” completely encircles the bust, and is preceded by a single plain cross which points directly to a border bead. The legend is an abbreviated translation of “Elizabeth II by the Grace of God, Queen of all the Britains, Defender of the Faith” The border consists of circular beads, and the beads sit inside a small raised rim. Reworked design as Obverse 1 with Elizabeth’s bust facing right, wearing a wreath containing 6 berries and 11 leaves, which is tied behind the head with a ribbon, the ends of which trail loosely behind. The engravers initials M.G. are incuse, and are located on the raised edge found at the base of the bust above the “BR” of BRITT. 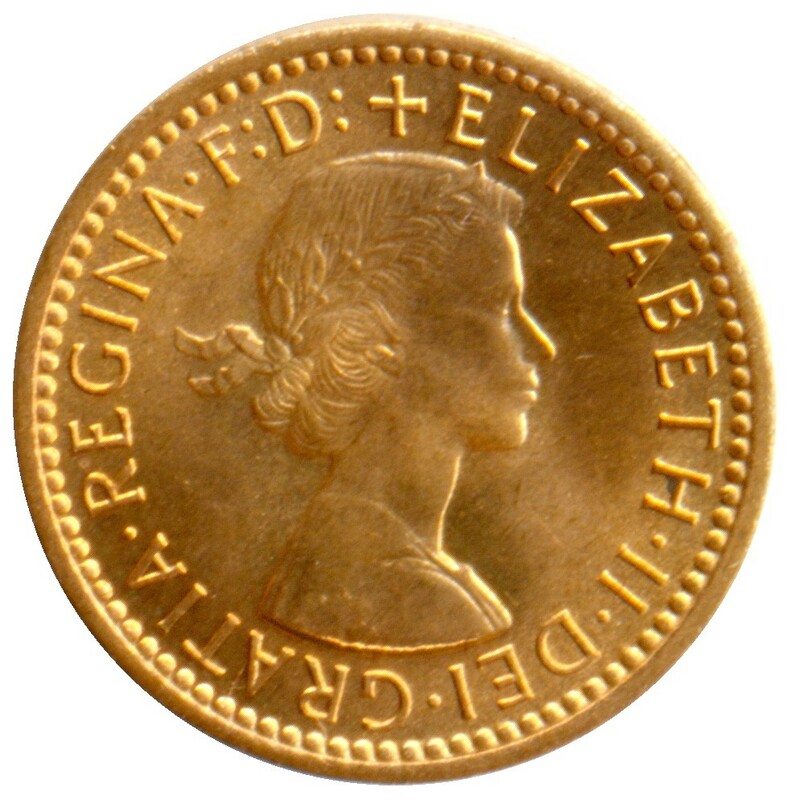 The legend which reads “ELIZABETH II DEI GRA: BRITT: OMN: REGINA F: D:” completely encircles the bust, and is preceded by a single plain cross which points directly to the gap between two border beads. The legend is an abbreviated translation of “Elizabeth II by the Grace of God, Queen of all the Britains, Defender of the Faith” The border consists of circular beads, and the beads sit inside a small raised rim. Similar to Obverse 2, with Elizabeth’s bust facing right, wearing a wreath containing 6 berries and 11 leaves, which is tied behind the head with a ribbon, the ends of which trail loosely behind. The engravers initials M.G. are incuse, and are located on the raised edge found at the base of the bust above the “G” of GRATIA. The amended legend which reads “ELIZABETH. II. DEI. GRATIA. REGINA. F: D:” completely encircles the bust, and is preceded by a single plain cross which points to the right side of a border bead. The legend is an abbreviated translation of “Elizabeth II by the Grace of God, Queen, Defender of the Faith” The border consists of circular beads, and the beads sit inside a small raised rim. 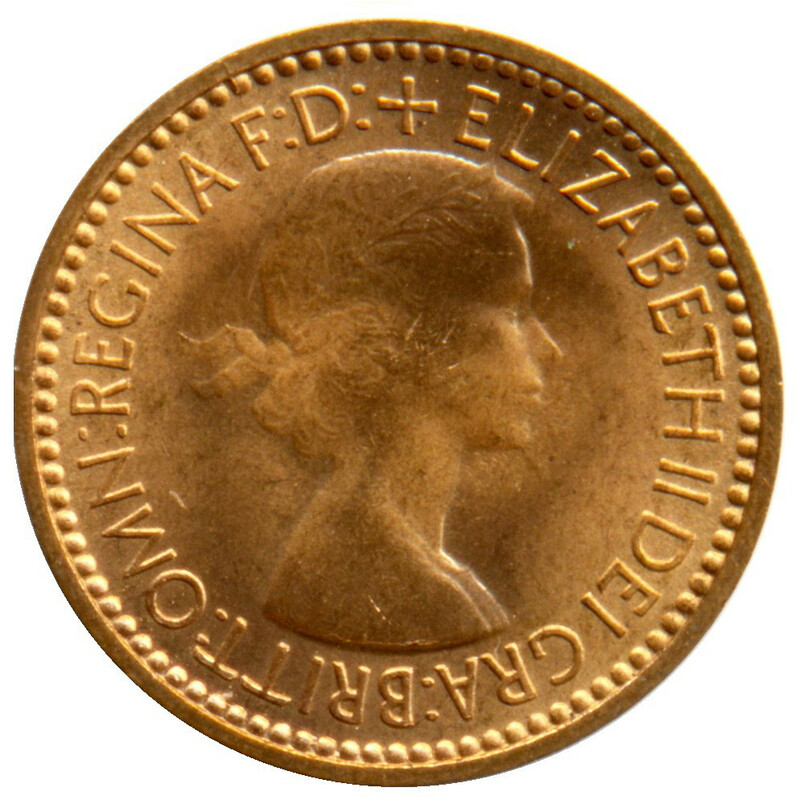 Struck from the remaining George VI reverse dies, with a wren facing left, the denomination “FARTHING” below, and the date in numerals above. Behind the wren’s left foot is the engravers monogram “HWP”. The border is toothed, and the teeth sit inside a small raised rim. 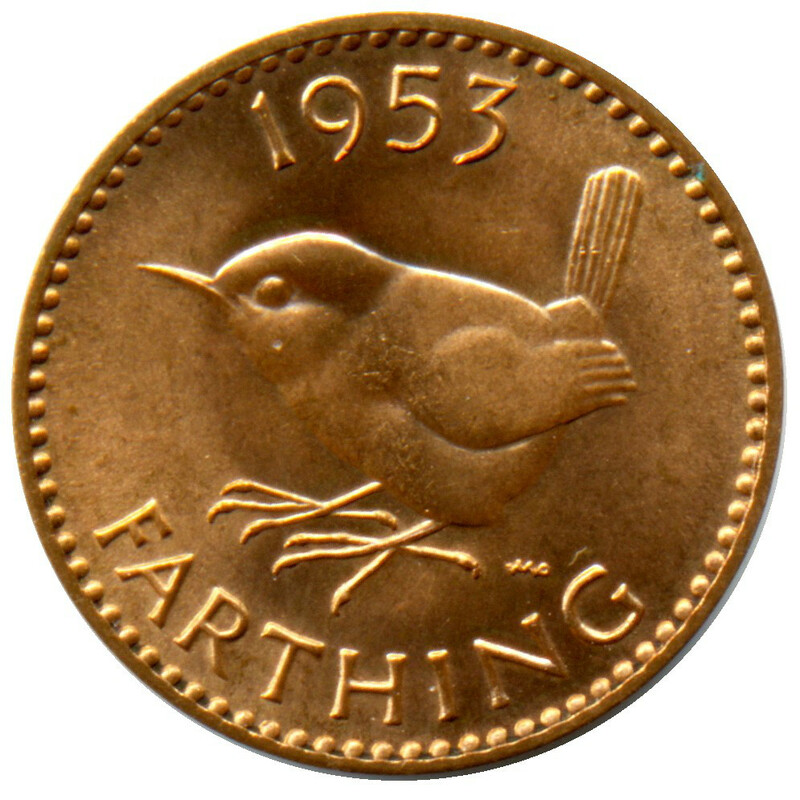 The “I” in FARTHING points directly to a gap between two border teeth. 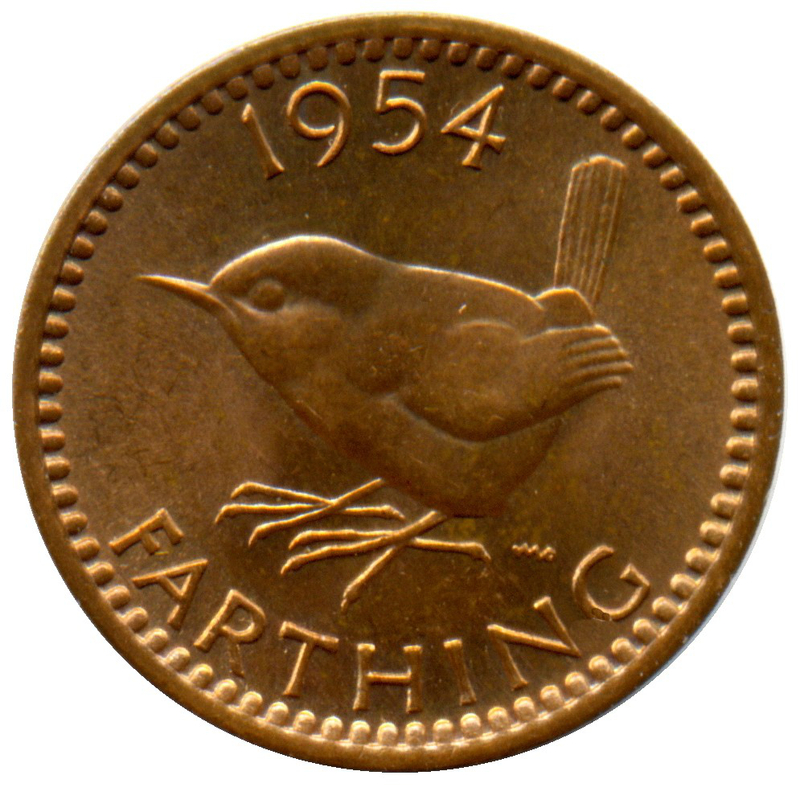 Similar to the Reverse A, with a wren facing left, the denomination “FARTHING” below in a slightly different font, and the date in numerals above. Behind the wren’s left foot is the engravers monogram “HWP”. The border is toothed, and the teeth sit inside a small raised rim. The “I” in FARTHING points directly to a border tooth. Similar to reverse B, with a wren facing left, the denomination “FARTHING” below, and the date in numerals above. Behind the wren’s left foot is the engravers monogram “HWP”. The border consists of longer teeth, and the teeth sit inside a thicker raised rim. 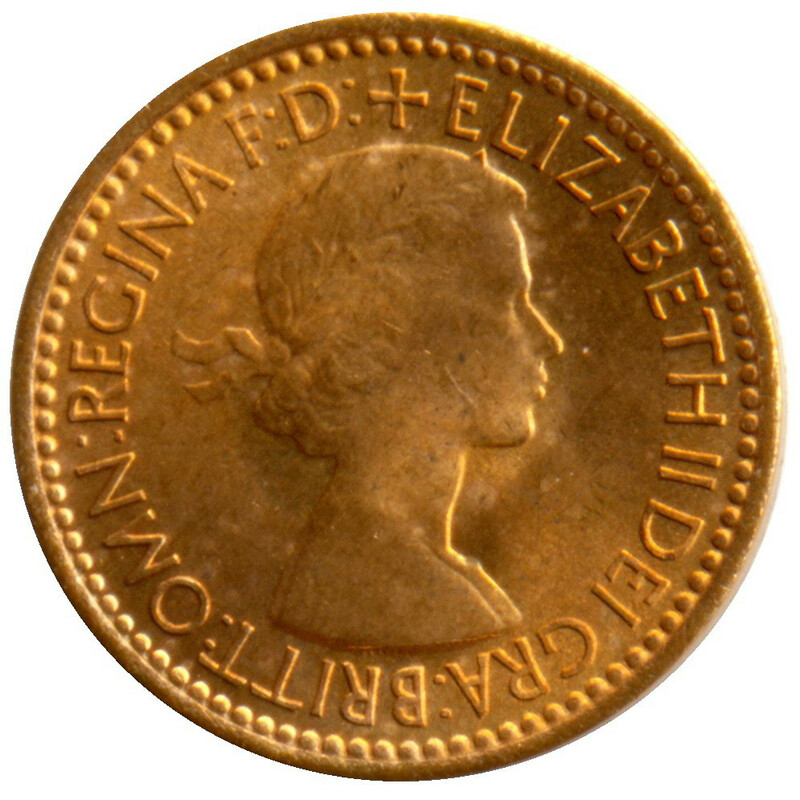 The “I” in FARTHING points to the right side of a border tooth. 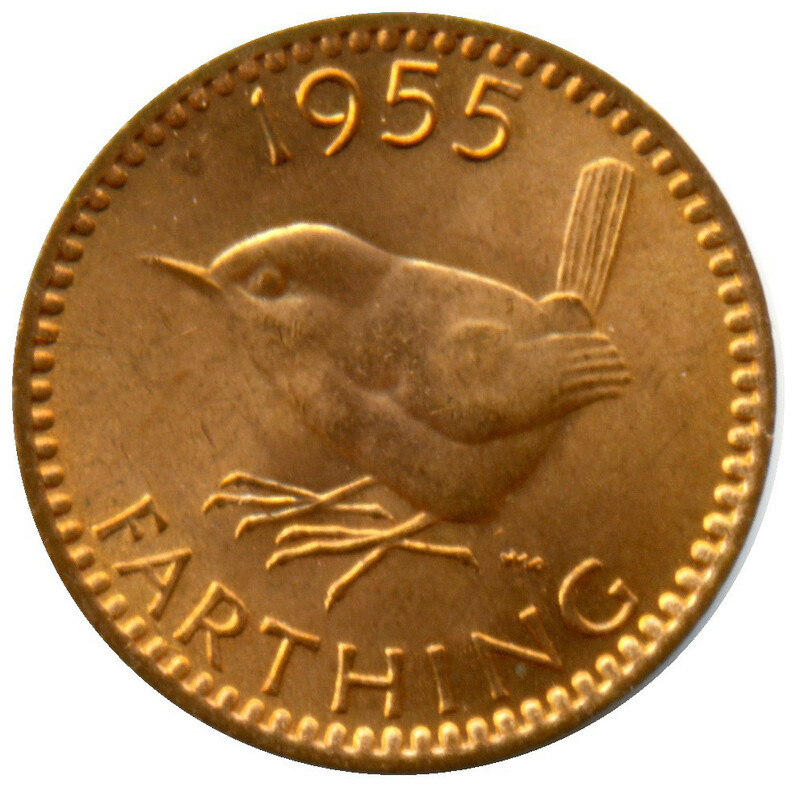 Similar to reverse C, with a wren facing left, the denomination “FARTHING” below, and the date in numerals above. Behind the wren’s left foot is the engravers monogram “HWP”. The border consists of longer teeth, and the teeth sit inside a thinner raised rim. 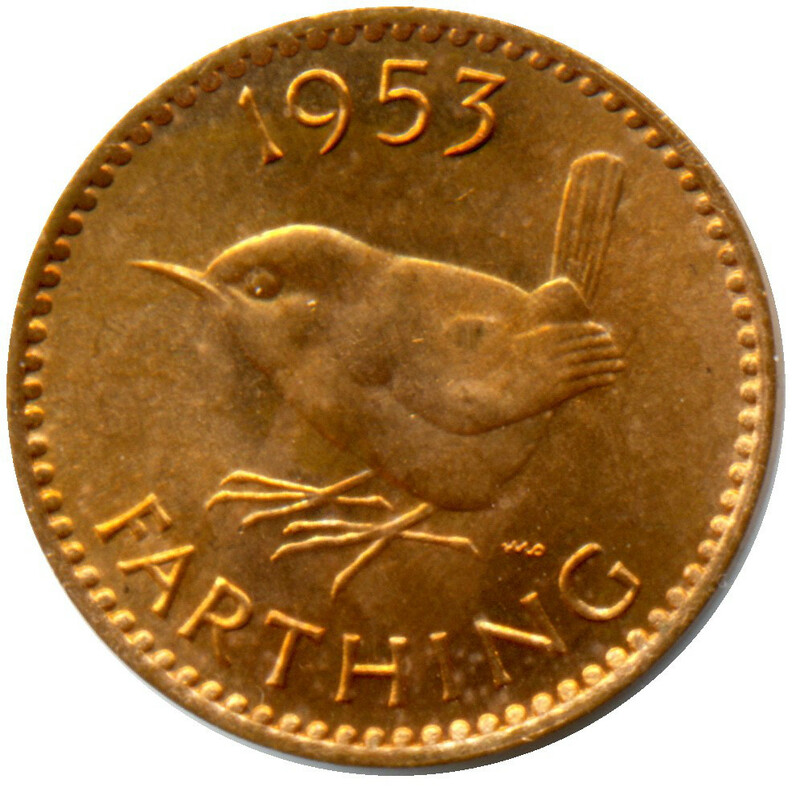 The “I” in FARTHING points to the right side of a border tooth.